This is the best pud I’ve made in ages (and I'm not the world's biggest fan of meringue pies). 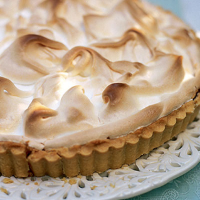 I would say that the tartness of the gooseberries works even better with the sweet meringue than traditional lemon does. To make the pastry, put the flour, butter and a pinch of salt into a food processor and whiz until the mixture resembles breadcrumbs. Add the caster sugar and whiz again, then gradually add just enough egg and water to bring the pastry together into a ball. Wrap in clingfilm and chill for 45 minutes. Preheat the oven to 190°C/gas 5. Roll out the pastry and use it to line a 31/2cm-deep, 24–25cm metal tart tin with removable base. Prick the bottom of the pastry with a fork, then chill for 15 minutes. Line with paper, fill with baking beans and bake for 15 minutes; remove the paper and beans and return to the oven for another 10 minutes until it has turned a pale biscuit colour. Remove from the oven. Put the gooseberries in a pan with 2 tbsp water and 150g caster sugar. Cover and gently heat, stirring, until tender. Some will stay whole; some will become mushy. Strain the mixture through a sieve, set the gooseberries aside and put the strained liquid back into the saucepan. Simmer this until it has reduced to about 200ml. Mix 5 tbsp of this reduced liquor with the cornflour, until smooth. Pour into the saucepan and add the drained gooseberries. Bring to the boil and stir to thicken. Add the egg yolks and stir well to combine. Remove from the heat immediately. Pour the mixture into the pastry case and leave to cool. With an electric whisk, beat the egg whites in a large, clean bowl until you have medium peaks (when you hold up the beaters the mixture should be firm but the peaks just slightly droop over). Add 1 tbsp caster sugar and beat this in, then continue in the same way, whisking and adding the sugar until you have a stiff, glossy mixture. Spoon this over the tart, making sure that you cover the rim of the pastry and don’t leave any gaps. Return to the oven for 25 minutes. A light, fragrant coffee is the best choice here.